There are few mysteries in life as beautiful and intoxicating as the genuine happiness that comes from true love. While there are many obstacles that may hold us back from finding ‘the one’, the greatest struggle may be overcoming yourself. From a young age, we are taught that one of the ultimate goals in life is to find love, a theme that we see highlighted in our fairy tales and classic romance movies. When we enter into the confusing, challenging and demanding world of love and dating, many find themselves overwhelmed because it’s not as easy as we’d been led to believe. Prince Charming isn’t riding in to whisk you away with no effort. Love is messy, challenging and a lot of work. We have to be willing to open ourselves up, be vulnerable and make compromises. While you may have faced some genuine challenges in your search for love, including unfaithful partners or the struggles of long distance, in many cases the biggest barrier between you and true love is YOU! Whether you are building walls around your heart keeping others out, failing to compromise or still holding onto baggage from your past, you need to recognize that you ultimately control whether you find true love or not. Regardless of what you may come up against in life, you show no fear. This strength and independence are revered by many, but they may be your biggest challenge when it comes to establishing a relationship. You fear that getting into a committed relationship will leave you feeling trapped, unable to achieve your goals and dreams. Remember, a romantic partner doesn’t have to be a weight, you need to find your partner in crime. It should come as no surprise that your strength is going to cause some trouble in your quest for love. After all, relationship experts around the globe stress the importance of compromise. While you want to compromise there is a fear in the back of your mind that compromising who you are will lead to losing yourself entirely. Try to remember that this isn’t an ‘all or nothing’ concept. The social butterfly of the zodiac, you genuinely love life and the connections that you establish everywhere you go. You’re a huge flirt who wants to find love, but your need for versatility and excitement means you get bored easily. You’re afraid that settling down with one person will take all the wind out of your sails, leading you to a humdrum life. If you find the ‘right’ person in life, you can create your own excitement. Your emotions are both your greatest strength and biggest setback when it comes to your love life. On one hand, you are compassionate and sensitive allowing you to connect with your partners on a deep level. However, you’re afraid that someone is going to break your heart. Don’t close your heart off. Instead, search for someone who will protect it. The example of true romance, you genuinely want to find someone to build a life with. However, you can become incredibly self-conscious when you are in a relationship. Why would some so bold and confident doubt themselves in this way? You’re afraid that your partner may stop loving you. This won’t be easy to get past, but you need to trust the process. You’ve got a clear idea of what that ‘perfect partner’ looks like, and you have no interest in settling for anything less. 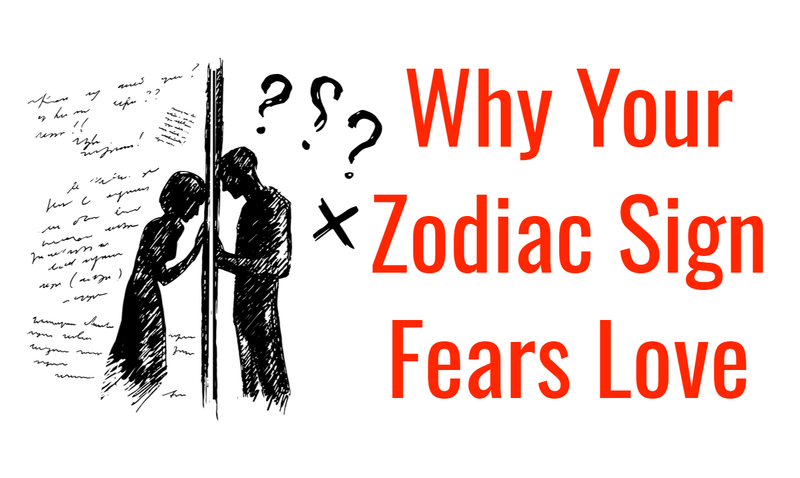 This is where your fear comes into play – You are truly afraid that you aren’t going to find someone worthy of your love. You need to take a good, hard look at your expectations to ensure that they aren’t impossible to fulfill. While it may seem to others like you’ve got your life all figured out with your love for balance and harmony, the truth is that you are incredibly indecisive. This makes the concept of love difficult to obtain, as you’re jumping from one casual fling to the next. You’re afraid that the second you settle down, something better will come along. Try to focus on the here and now, even the best relationships will require hard work and dedication. Everyone knows that you’re a skeptical person, suspicious of everyone you meet and every situation you encounter. While this line of thinking may help to keep you ‘safe’ in your career decisions and financial planning, your fear of being betrayed by the one you love may just keep you from finding love at all. You need to learn to put yourself out there accepting that yes, you may be hurt, but when you find ‘the one’ it will all be worth it. The great adventurer of the zodiac, you are always on the search for excitement and new experiences. In fact, this is the very basis of how you live your life. There is nothing you fear more than being tired down, causing you to view the idea of a committed relationship as a ball and chain. Rather than running from life entirely, try searching for your co-pilot, ready to explore this world with you. Throughout your life, you aim to make every decision with a clear, calm, logical mindset, keeping your emotions ‘safely’ buried away. However, to really connect with someone your emotions need to be part of the equation. There is nothing you fear more than failure in life, and your love life is no exception. To truly connect and make love last, you need to be vulnerable. You value your individuality and uniqueness above all else in life, a trait that you refuse to give up for anyone. If there is anything that you fear in life, it’s the idea that someone may try to squash your freedom to be you, forcing you to conform. Keep your heart and mind open, there’s someone out there who will love you for who you are. While you’ve dreamt of finding true romance all your life, you struggle to truly open up and allow anyone in. Why? You fear that someone is going to take advantage of you, leading you on only to break your heart. When you find ‘the one’ they will move mountains to protect your heart and give you the world. Don’t stop looking yet.